Waterlocks & Mufflers | Exalto Emirates LLC. Combining the functions of a muffler and gooseneck saves installation&nbsp;time and space whilst maintaining the essential qualities of a good&nbsp;exhaust system. The gooseneck prevents water back filling the exhaust&nbsp;and the muffler creates additional water mixing to further reduce&nbsp;exhaust noise. The results are impressive with negligible back pressure in the system. 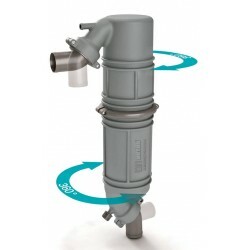 Both the sections and the hose connections of this new&nbsp;model are fully rotatable, ensuring ease of installation. A hose stub to&nbsp;connect an air vent is standard. Available with hose connections of &Oslash;&nbsp;40, 45 or 51 mm. 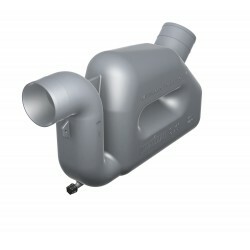 Exhaust system with the water injection point &ldquo;C&rdquo; 15 cm&nbsp;or more above the waterline. The NLP3 waterlock / muffler is the quietest in the world. Due to its unique&nbsp;three chamber construction the sound attenuation is an incredible 10 dB&nbsp;more than that achieved with a two chamber waterlock. No other waterlock&nbsp;in the market reduces the sound better. 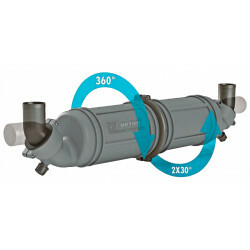 The NLP3 has rotatable chambers as&nbsp;well as rotatable hose connections, ensuring quick and simple installation&nbsp;in even the most confined spaces. 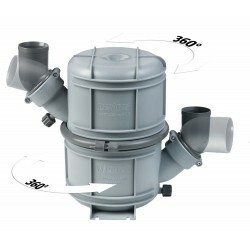 It is available with hose connections to&nbsp;suit internal hose diameters of &Oslash; 40 mm, &Oslash; 45 mm or &Oslash; 50 mm.&nbsp; Provided with drain plugs for winter storage. Straps to secure the waterlock&nbsp;to the boat are supplied as standard. Capacity 4 Liters. For exhaust hose with internal diameters of 40 mm, 45 mm or 51 mm. Provided&nbsp;with a plug for draining during winter time. 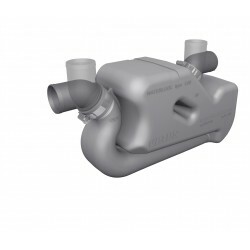 The inlet connection of these 3&nbsp;models will revolve through 360&deg;, which greatly facilitates the installation of the&nbsp;exhaust assembly. There is a larger waterlock for 51 mm ID hose (shown below)&nbsp;which is recommended for assemblies with longer length exhaust hose (more than&nbsp;4 meters total hose length). Capacity 4.3 Liters. Suitable for exhaust hose with 30 mm ID. For exhaust hose with internal&nbsp;diameters of 51 mm, 60mm, 76 mm or 90 mm. 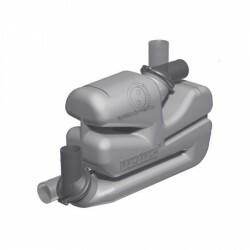 The smaller model L50R,&nbsp;shown above, is to be used when the exhaust line is relatively short, whereas the&nbsp;larger model LP50S should be used with a long length of exhaust hose. These&nbsp;waterlocks are provided with a drain plug. Sometimes, notably in the case of sailing yachts, the exhaust line is so long that an extra large waterlock is needed to prevent the large volume of water in the line from running back into the engine once it has been stopped. Vetus waterlocks type LSG, LSS and LSL are the ideal solution&nbsp;for boats sailing in rough waters, without the engine running. To simplify installation of models LSS and LSG, both the inlet and outlet stubs will&nbsp;rotate through 360 degrees. They are also fitted with a drain plug for winter storage. It is possible to fit a sensor for an exhaust temperature alarm&nbsp;into the inlet hose connection of the LSG. Model LSS features a reduced height of 225 mm, thus enabling easy installation under floor. These waterlocks are designed for long relatively straight exhaust runs, for&nbsp;example in sailing boats. 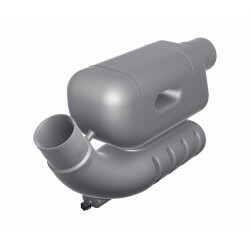 They have fixed (non-rotating) inlet and outlet&nbsp;connections and are available for &Oslash; 60 mm, 75 mm or 90 mm internal&nbsp;diameter exhaust hose. Two securing straps are standard supply. Capacity 16 Liters. Available for exhaust hoses of &Oslash; 40 mm, 45 mm, 51 mm, 60 mm, 75 mm,&nbsp;90 mm and 102 mm ID. 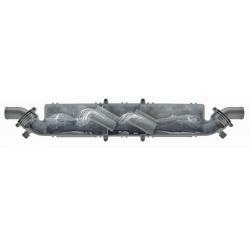 This muffler creates additional mixing of the water&nbsp;inside the exhaust line, which results in even better noise reduction. 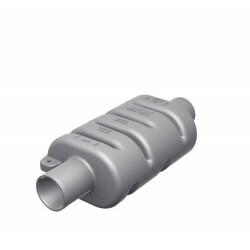 The&nbsp;construction of the muffler causes almost no resistance to the free flow of&nbsp;the exhaust gases. Generator sets and marine diesel engines often produce disturbing, gurgling exhaust noises. 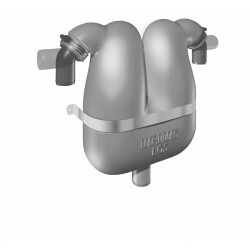 The Vetus gas/water separator type LGS offers the&nbsp;ultimate solution, because it separates the injected raw cooling water from the exhaust gases. In addition, the LGS gas/water separator has great&nbsp;sound-deadening capacities and it functions as a gooseneck as well. 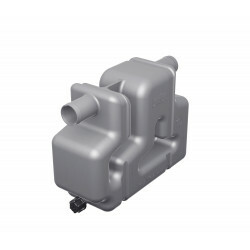 The models LGS 40/45/50 are supplied with hose connectors with diameter &Oslash;&nbsp;40, 45 or 50 mm, which can rotate through 360&deg; and they have a capacity of 7 liter. 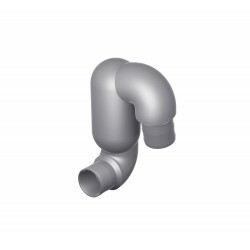 The cooling water drain pipe has a diameter of &Oslash; 38 mm. The&nbsp;models LGS 60/75 have 360&deg; rotatable connectors, with a diameter of &Oslash; 60 or 75 mm. The capacity is 12 liters and the cooling water drain pipe&nbsp;has a diameter of &Oslash; 50 mm. A stainless steel mounting bracket with synthetic straps is supplied as standard with all models. The temperature sensors, to be fitted into the exhaust hose or the waterlock/muffler, and the alarm unit, must be ordered separately. In the case of a twin engine installation 2 sensors may be connected to 1 alarm unit, if so required. One sensor may also serve two alarm units, e.g. in the case of a second steering position. Cut-out dimensions: &Oslash; 52 mm. Outside dimensions: &Oslash; 62 mm. Available for 12 and 24 Volt dc. A blockage in the engine water intake or a damaged pump impeller will result in complete loss, or severe reduction in the volume of cooling water in the exhaust system. In this case the temperature of the exhaust will rise much faster than the temperature of the engine. 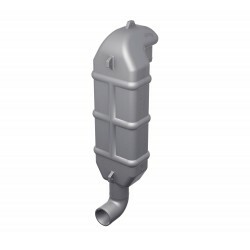 It is recommend that a Vetus exhaust temperature alarm is always installed in the exhaust line. 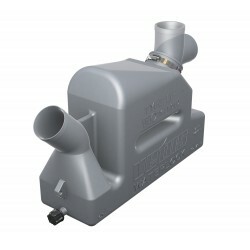 This alarm is designed for water injected exhaust systems. 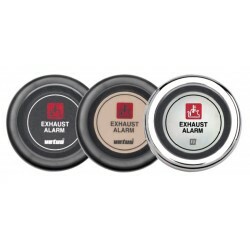 It provides a visual and an audible alarm when the temperature inside the exhaust hose or the muffler exceeds.